Heard from one of my old college roommates from UGA the other day. He sounded great considering he just had a triple bypass operation. That was followed by a conversation I had with another friend who was getting ready for hip replacement and yet another told me that she found her boyfriend dead in his apartment. Even more depressing was the realization that these things that were happening to my friends was not due to the position of the moon or bad karma or just plain rotten luck. No ... it's due to OLD AGE. You hit a certain age and these are the things that you hear. Me ... "Hey, (fill in any old fart's name). How are you?" 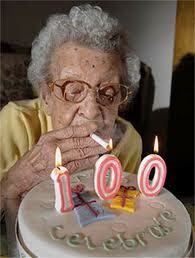 Old fart friend ... "Well ... to tell you the truth ... been having a few medical problems." Me ... "That's too bad (I've learned not to ask about them)." Friend ... "You see I had this surgery (I knew they'd tell me anyway) on my heart. Triple bypass ... my reflux still acts up and I was told that my entire respiratory system has to be replaced,"
Me ... "Well ... um ... you look good." Friend ... "I'm on a new diet where I eat only things that grow in the desert and have no white, green or red color. 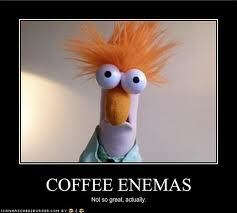 I cleanse my body once a day with something I read about ... coffee enemas." Me ... "Is it working?" Friend ... "I still feel like crap ... but at least I'm not dead."